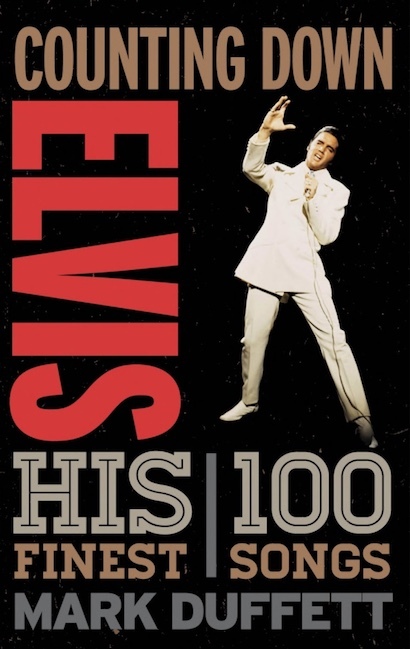 "Counting Down Elvis: His 100 Finest Songs"
At first glance, Elvis Presley fans may find Mark Duffett’s new book, Counting Down Elvis: His 100 Finest Songs, to be a double-edged sword. 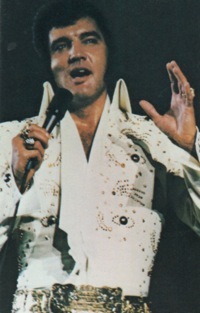 While reading the Contents page listing the author’s choices for the King’s “finest” songs, Presley admirers may find themselves grimacing and mumbling alternately, “How can he put that song on the list?” and “How could he have left that song off the list?” Once the reader calms down, though, and acknowledges that every Elvis fan would have come up with a different list, Counting Down Elvis develops into one of the most affirming, Presley-positive volumes ever published. Elvis Presley fans are going to love this book. “A reader in media and cultural studies at the University of Chester” in England, Duffett says he first took an interest in Elvis while briefly working for Sony Music in the mid-1990s. In 1999 he completed a PhD thesis exploring the “relationship between the singer and his fans.” The “About the Author” blurb states that Duffett is “widely recognized as an expert on popular music and media fandom.” While admitting that he has accumulated “quite a library of Elvis material” during his research, in his book Duffett never openly confesses to being an Elvis Presley fan. There’s no mistaking it, though; Mark Duffett is an Elvis fan. No one could write so effusively about Presley’s music without being one. 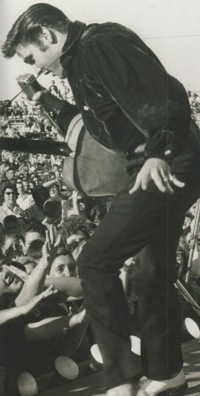 The Elvis faithful will recognize the hand of a kindred spirit on each passing page. The author aspired to a wider audience than just Elvis fans, though. “I hope Counting Down Elvis will have at least two types of readers,” he explains. “Recent fans, who want to get beyond the greatest hits and do not know where to start, and dedicated fans, who might use it as an inspirational day to day.” In his Introduction, Duffett challenges inquiring and committed Elvis readers alike—“Listen again to the recordings, and Elvis amazes. Think about what they mean, and he astounds.” Most Elvis fans listen to his music and are amazed. Counting Down Elvis tries mightily to move beyond the sound and find meaning in Elvis’s songs. I’m not going to reveal any of the number placements of Duffett’s choices for Elvis’s top 100 finest songs. Seeing that list for the first time on the Contents page is an entertaining eye-opener not to be denied the reader. However, commenting on Counting Down Elvis requires naming some of the titles. For the record, then, all of the songs mentioned below are on Duffett’s list … somewhere. The book’s text reveals that “His Finest Performances” might have been a more apt subtitle for the book. Many of Elvis’s most well known songs have been recorded in various formats. 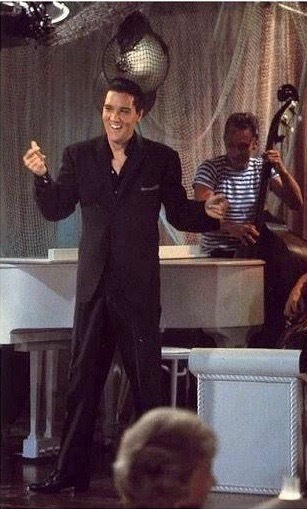 For instance, multiple recorded versions exist of Elvis singing “Can’t Help Falling in Love”—the original studio version, the ’68 Comeback special version, and any number of live concert versions. 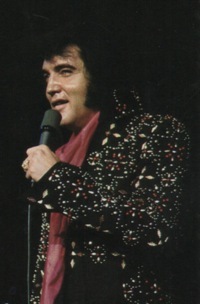 When the song appears in his top 100 countdown, Duffett specifies that it’s Elvis’s live performance of that song in the 1973 Aloha special that earned a spot on his “finest” list. So, for Duffett, it’s a combination of the song and Elvis’s performance of it that makes his list. A perusal of the list in Counting Down Elvis reveals the following breakdowns. 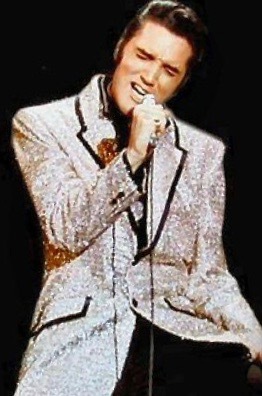 Starting with the three decades of Elvis’s career, there are 24 from the ’50s, 34 from the ’60s, and 42 from the ’70s. Other notable totals include 7 Sun Records titles, 12 cuts from the ’68 Comeback special, 7 songs from ’68 Memphis sessions, 9 gospel numbers, and 21 live performances from the ’70s Las Vegas stage and road shows. Of the over 200 songs that appeared in Presley’s Hollywood movie soundtracks, only 9 made the list, and many of them, notably “Love Me Tender,” “Jailhouse Rock,” “Viva Las Vegas,” and “Bossa Nova Baby,” probably would have qualified without their use in Presley films. Over 223 pages, the main text of Counting Down Elvis provides short essays on all of the 100 Presley song titles. For Elvis historians, the background of each song—writer(s), genre, earlier and later recordings—is provided. When Elvis’s recording was a cover, Duffett contrasts it with the original. Noting that Elvis’s music was “always a team effort,” the author recognizes the contributions of musicians and background singers along the way. Sometimes, especially impactful players, such as American Sound producer Chips Moman and songwriter Mac Davis, receive special treatment. Counting Down Elvis contains no photos or images of any kind. Rather, it relies on Duffett’s vibrant language to assist the reader’s visualization of Elvis’s performances. The range of lively to raucous modifiers he uses to describe Elvis’s recordings is astonishing. Just a few examples: “sublime,” “slick,” “quaint,” “charming,” “flamboyant,” “celestial,” “ethereal,” “epic,” “sincere,” “twinkling,” “lush,” “tender,” “breezy,” “towering,” “tight,” “vertiginous,” “majestic,” “haunting,” “stunning,” “punchy,” “lusty,” “desperate,” “sweaty,” “assertive,” “swashbuckling,” “capricious,” “desperate,” “riotous,” “sinister,” “poignant,” “strutting,” “raw,” and “explosive.” Oh, and before you start reading this book, make sure you know what “existential” means. You’re going to see that one a lot. Duffett further spices up his writing with some clever figurative language. For instance, he declares that Elvis’s performance on “Lawdy Miss Clawdy” is “so intense that it almost—in the best way—scratches your ears.” “Let Yourself Go” is described as a “barely restrained encounter with chaos,” and “Tiger Man” feels like, “riding the bumper cars.” Much of the author’s metaphoric language challenges readers to ponder Elvis’s music in ways they’ve never imagined before. Even though, on the surface, Counting Down Elvis is made up of 100 mini-essays, several underlying themes emerge into focus along the way. One of the most interesting is the author’s unique overall assessment of Elvis’s meandering musical career. Duffett dismisses the traditional rollercoaster depiction of Presley’s musical journey. 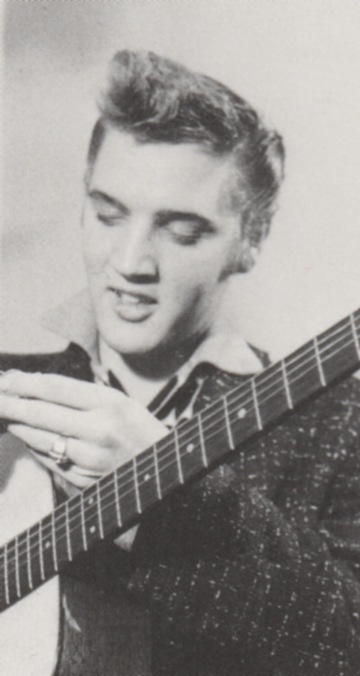 He admits that in Presley’s career there were “both peaks and troughs—moments of great achievement, times of indifference, phases of desperation and despair,” but nevertheless maintains that Elvis was always in control of his musical path. After leaving the army, the author says, Elvis realized his broad appeal allowed him to “alternate between assertive showcase pieces and softer ballads.” He points out that “Are You Lonesome Tonight?” came between “It’s Now or Never” and “Surrender.” All three reached #1. He asserts that whenever Elvis realized the world was changing around him, he took his music in a new direction. “Elvis straddled the mainstream of society and held together the center ground. It was a musical balancing act.” When he sensed in the late sixties that the country needed songs that would unite people, he came up with “If I Can Dream” and “In the Ghetto.” Elvis remained in the middle, commanding the musical spectrum and bringing the world together until his death. Duffett’s vision of Presley, always at the controls of his musical career, making all the right moves to maintain his relevancy, is one, no doubt, that many of the singer’s fans would like to believe. Unfortunately, the format of Counting Down Elvis just doesn’t provide enough space for the development of such an idealized approach to Elvis’s complex musical career. Another topic Duffett touches on from time to time is the impact of race on Elvis’s music. Here and there in the text, the author addresses the critical questions: “Was Elvis a racist?” “Did Elvis steal the black man’s music?” “Why did Elvis sit on the sidelines during the Civil Rights Movement?” Elvis fans will be heartened by the author’s basic answers to those questions. Again, though, the complexities of race issues in Elvis Presley’s life and musical career are too extensive to be sufficiently addressed in the format of Counting Down Elvis. Perhaps in Mark Duffett’s next book … ? Certainly the most startling emerging theme in Mark Duffett’s Counting Down Elvis revolves around the author’s unique historical perspective on Elvis Presley’s musical career, or in other words, Elvis Presley’s legacy in popular culture and beyond. The author’s assertions of Elvis’s impact on American music, Western culture, and even world politics, exceed by far any legacy previously granted him by scholarly analysts.